Paramedic Training Spot aims to simplify the process of learning about paramedic training, the career of a paramedic, and the entire EMS field as a whole. While our readers come from all walks of life, our target audience are those that are just beginning their journey towards becoming a paramedic, as well as young people who are interested in becoming an EMT but aren’t quite sure how to go about it. While some jobs may become obsolete due to budgetary concerns or advancing technology, the demand for EMS workers continues to rise. In fact, employment of Emergency Medical Technicians and Paramedics is expected to grow by 33 percent between 2010 and 2020. And as employment grows, more workers dedicated to helping their fellow man and woman will be pursuing the health care industry. With that said, understanding how to become a paramedic can sometimes make one feel ensnared in a maze of ever-changing information. Each state has different requirements for licensure, with some even requiring successful completion of a state paramedic examination. And if you’re already a paramedic but want to practice in another state, well, some states don’t even offer reciprocity. With different states having their own terminology for EMT and Paramedic levels, paramedic programs varying greatly in length and tuition cost, and the requirement for all paramedic applicants seeking national certification to have successfully completed education from an accredited program come 2013, the process of becoming a paramedic can feel quite daunting. At Paramedic Training Spot, we want to make things easier on you by streamlining this wealth of information, providing listings of schools and programs you can apply to, and offering helpful tips that will ease your anxiety and allow you to solely focus on what matters most: becoming an EMT Paramedic. In addition, we aim to provide you with a thorough understanding of the health care industry as a whole. For news on health and medicine, details on the careers of EMTs, paramedics, and nurses, the importance of women and minorities in EMS, and interviews and guest posts from influential people in the industry, please visit our blog page and follow us on Facebook, Twitter, and YouTube. · How Long Will It Take to Become a Paramedic? 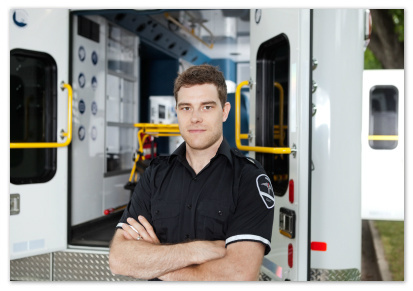 Looking for Paramedic Training Requirements? Looking For Paramedic Training Schools and Programs?